You may already know that PandwaRF supports USB connection to Linux using the RfCat Python script. Since a few releases we progressively added USB mode to connect your PandwaRF to your Android phone! This comes as an additional connection mode, which offers some greater data throughput over BLE. If your Android phone is USB Host capable (Android 3.1 and higher), then just plug in your PandwaRF using a Micro USB OTG (USB On-The-Go) Male-Male. When connected in USB, you will notice that transfer time is way faster than in BLE. For Spectrum Analyzer, I personally experienced 27 meas per second on Moto G/E. Also the number of channels can be set up so you increase the frequency range. And surprise bonus: the PandwaRF Android application also supports the Yard Stick One in a limited mode! Not all features are compatible, but we are working to support as much as we can. There are still some issues on some phones. Please be patient and do not hesitate to enter a defect. Since this requires a major rework of the app and the library, please be patient. 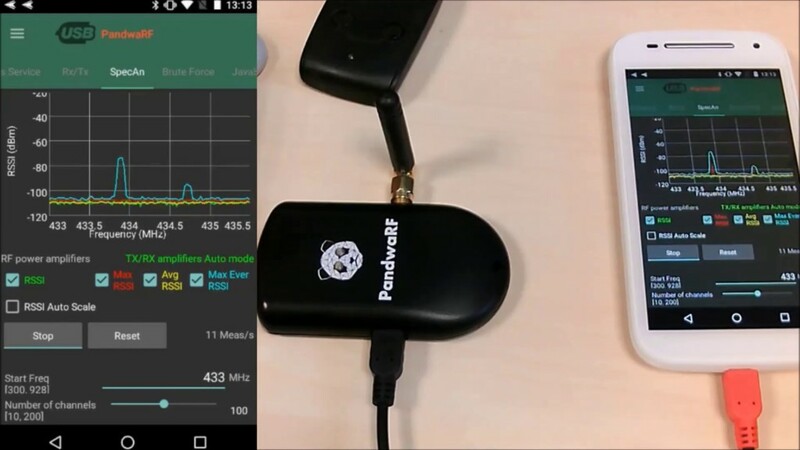 Here is the PandwaRF USB mode demo video, showing how to connect your PandwaRF to an Android phone using the USB host feature, or USB OTG. For the video we used an Android smartphone with the USB host feature, a PandwaRF dongle and a USB OTG cable.